Inspired by the rich structure of covariant string field theory, we propose a minimal gauge invariant action for general massive integer spin n field. The action consists of four totally symmetric tensor fields of order respectively n, n − 1, n − 2 and n − 3, and is invariant under the gauge transformation represented by two also totally symmetric fields of order n − 1 and n − 2. This action exactly has the same gauge structure as for the string field theory and we discuss general covariant gauge fixing procedure using the knowledge of string field theory. We explicitly construct the corresponding gauge fixed action for each of general covariant gauge fixing conditions. M. Fierz and W. Pauli, On relativistic wave equations for particles of arbitrary spin in an electromagnetic field, Proc. Roy. Soc. Lond. A 173 (1939) 211 [INSPIRE]. E.P. Wigner, On unitary representations of the inhomogeneous Lorentz group, Ann. Math. 40 (1939) 149 [Nucl. Phys. Proc. Suppl. 6 (1989) 9] [INSPIRE]. X. Bekaert and N. Boulanger, The unitary representations of the Poincaré group in any spacetime dimension, in 2nd Modave Summer School in Theoretical Physics, Modave, Belgium, 6-12 August 2006 [hep-th/0611263] [INSPIRE]. N. Bouatta, G. Compere and A. Sagnotti, An introduction to free higher-spin fields, in Higher spin gauge theories: proceedings, 1st Solvay Workshop, Brussels, Belgium, 12-14 May 2004, pg. 79 [hep-th/0409068] [INSPIRE]. R. Rahman and M. Taronna, From higher spins to strings: a primer, arXiv:1512.07932 [INSPIRE]. L.P.S. Singh and C.R. Hagen, Lagrangian formulation for arbitrary spin. 1. The boson case, Phys. Rev. D 9 (1974) 898 [INSPIRE]. G.B. West, The construction of gauge invariant actions for arbitrary spin and bosonic string field theories, Nucl. Phys. B 277 (1986) 125 [INSPIRE]. A.I. Pashnev, Composite systems and field theory for a free Regge trajectory, Theor. Math. Phys. 78 (1989) 272 [Teor. Mat. Fiz. 78 (1989) 384] [INSPIRE]. A. Pashnev and M.M. Tsulaia, Dimensional reduction and BRST approach to the description of a Regge trajectory, Mod. Phys. Lett. A 12 (1997) 861 [hep-th/9703010] [INSPIRE]. A. Fotopoulos and M. Tsulaia, Gauge invariant Lagrangians for free and interacting higher spin fields. A review of the BRST formulation, Int. J. Mod. Phys. A 24 (2009) 1 [arXiv:0805.1346] [INSPIRE]. I.L. Buchbinder and V.A. Krykhtin, Gauge invariant Lagrangian construction for massive bosonic higher spin fields in D dimensions, Nucl. Phys. B 727 (2005) 537 [hep-th/0505092] [INSPIRE]. I.L. Buchbinder and V.A. Krykhtin, Quartic interaction vertex in the massive integer higher spin field theory in a constant electromagnetic field, Eur. Phys. J. C 75 (2015) 454 [arXiv:1507.03723] [INSPIRE]. D.S. Ponomarev and M.A. 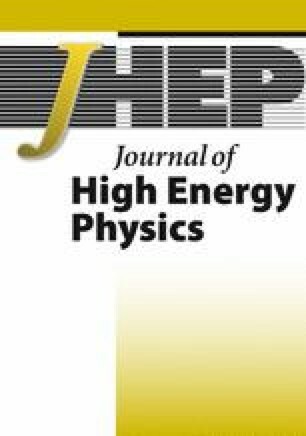 Vasiliev, Frame-like action and unfolded formulation for massive higher-spin fields, Nucl. Phys. B 839 (2010) 466 [arXiv:1001.0062] [INSPIRE]. D. Francia, Geometric Lagrangians for massive higher-spin fields, Nucl. Phys. B 796 (2008) 77 [arXiv:0710.5378] [INSPIRE]. M. Asano, Gauge invariant and gauge fixed actions for various higher-spin fields from string field theory, Nucl. Phys. B 868 (2013) 75 [arXiv:1209.3921] [INSPIRE]. A.K.H. Bengtsson, A unified action for higher spin gauge bosons from covariant string theory, Phys. Lett. B 182 (1986) 321 [INSPIRE]. A. Sagnotti and M. Tsulaia, On higher spins and the tensionless limit of string theory, Nucl. Phys. B 682 (2004) 83 [hep-th/0311257] [INSPIRE]. M. Asano and M. Kato, Extended string field theory for massless higher-spin fields, Nucl. Phys. B 877 (2013) 1107 [arXiv:1309.3850] [INSPIRE]. M. Bochicchio, String field theory in the Siegel gauge, Phys. Lett. B 188 (1987) 330 [INSPIRE]. M. Bochicchio, Gauge fixing for the field theory of the bosonic string, Phys. Lett. B 193 (1987) 31 [INSPIRE]. C.B. Thorn, Perturbation theory for quantized string fields, Nucl. Phys. B 287 (1987) 61 [INSPIRE]. L.P.S. Singh and C.R. Hagen, Lagrangian formulation for arbitrary spin. 2. The fermion case, Phys. Rev. D 9 (1974) 910 [INSPIRE]. M. Asano and M. Kato, Supersymmetric extended string field theory in NS n sector and NS n−1 -R sector, Nucl. Phys. B 910 (2016) 178 [arXiv:1603.04213] [INSPIRE].